« Do I See a Patch of Blue? Correct me if I am wrong, but if the correlation between stock prices and inflation goes down doesn’t that mean that stock prices are no longer surprised by changes in inflation? If the typical relationship is for stock prices to increase with nominal and real rates, then how is it that since the little depression began, stocks are up nearly 100% and yet nominal and real rates have declines? Open request. I have attempted a lay-person friendly Easy Guide to Monetary Policy. If people could have a look at it and make comments or suggestions, that would be good. Martin, Sorry, but you are wrong. The correlation that I am talking about is not between stock prices and inflation, but between stock prices and expected inflation. If the correlation between stock prices and expected inflation weakens, it could simply mean that other factors that affect stock prices were changing a lot and therefore accounted for most of the movement in stock prices. bubblesandbusts, Expected inflation is correlated with inflation, but it is only one of many factors that affect inflation. Statistically the relationship is telling us that if we hold all the other factors that affect stock prices constant, what percentage change in stock prices is associated with a one basis point change in expected inflation. 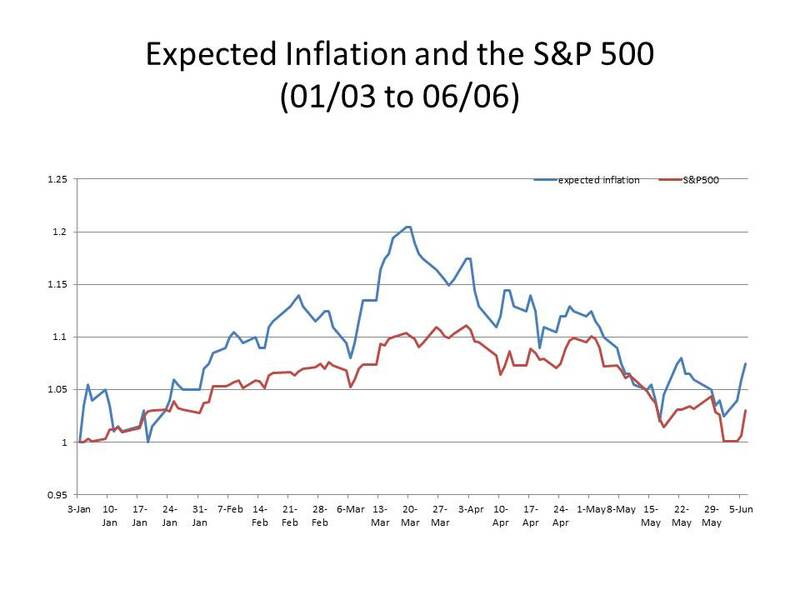 Just because that “partial” or ceteris paribus relationship is positive doesn’t imply that stock prices overall could not go up while inflation expectations overall went down. 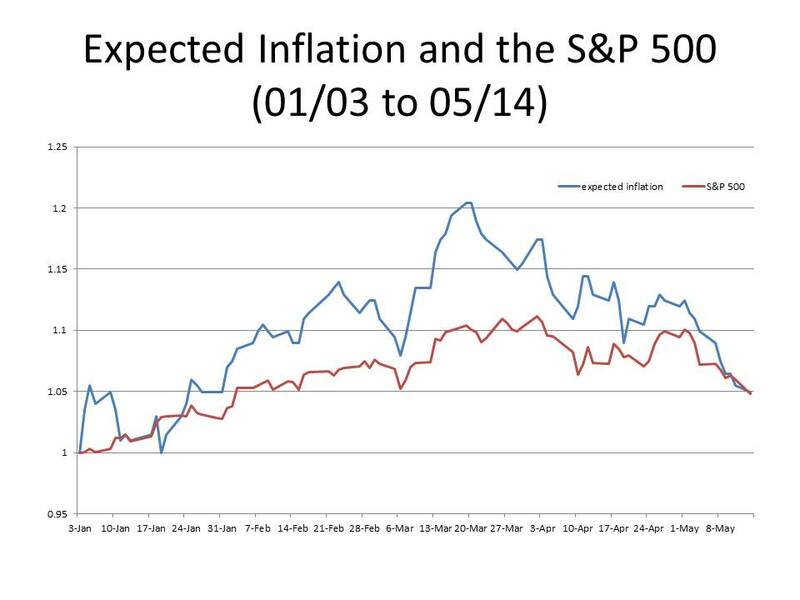 But in fact when stocks bottomed out, inflation expectations were even lower than they are now. David, what about the Mundell-Tobin effect? thanks for your answer; that was rather badly phrased by me. What I meant to say was that if inflation expectations differ across horizons then the stock market might respond to inflation expectations over a different horizon than the you’re measuring. 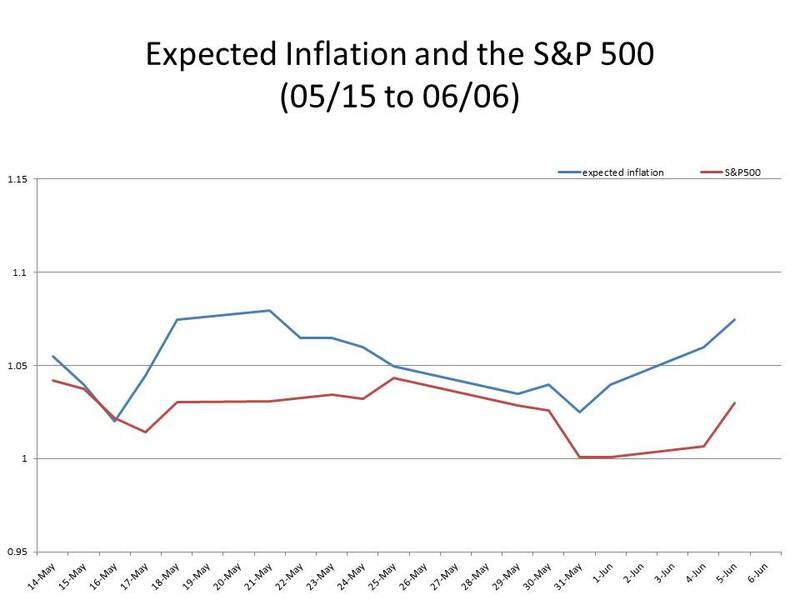 What came out was something akin to that the stock market already expects inflation expectations; that didn’t make much sense. That said, I take it the 20 year and the 10 year do not differ too much. Note BTW that this is the implied breakeven rate, which in theory has a time-varying risk premium when compared to the ‘true’ market expectations regarding the inflation outlook. This risk premium is likely to be correlated with risk premium on other assets, so to an extent there is an identification problem – is stocks go down, and so do breakevens to what extent is this due to the risk premium going down, and to what extent is this due to true expectations falling? 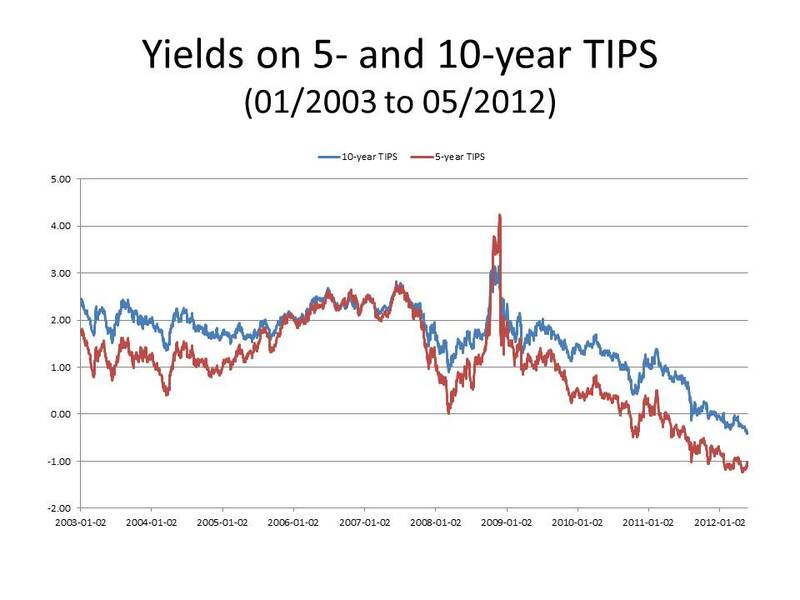 The chart on TIPS 5 year, and 10 year yield relationship. Does draw a picture that is simple to understand. The suggestion is that both are only going one way, and that is down. Buy GOLD to protect yourself. Saturos, Good question. The difference is that the Mundell-Tobin effect is a comparison between two alternative equilibrium time paths with different rates of expected inflation. The case that I am considering is a disequilibrium phenomenon in which the rates of interest and inflation must adjust before reaching a steady state equilibrium time path.